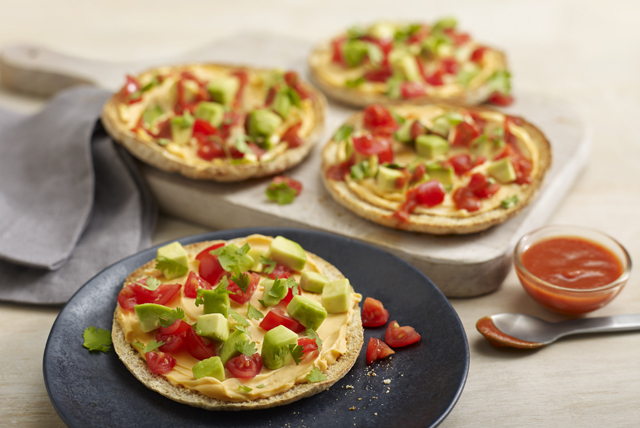 Our Mini Pitas with Creamy Cheddar, Avocado and Tomato make great snacks. Creamy cheddar cheese product is spread onto toasted mini pitas, then topped with chopped avocados and tomatoes for a winning flavour combination. Everyone is sure to love them! Spread cut sides of pita halves with cream cheese product. Top with avocados and tomatoes. Garnish with coarsely chopped fresh cilantro before serving. Drizzle lightly with Sriracha sauce (hot chili sauce) before serving.